It’s time to take your passion to the next level. Refine your skills by enrolling in our career-focused Media Arts and Science graduate program. Our project-based approach teaches students how to acquire the competencies needed to become successful professionals in the expanding digital media industry. When you earn a Master of Science degree in Media Arts and Science from the IU School of Informatics and Computing at IUPUI, you’ll set your sights on exploratory research that’s embedded in emerging technology. Our course of study is designed to build on your strengths in fields that focus on design and development with user interface and experience (UI/UX) research and immersive technologies such as augmented and virtual reality (AR/VR). Media Arts and Science faculty and students collaborate with the School of Medicine to create AMPATH health education videos. The MAS graduate program equips students with the skills to excel in many developing fields of industry. From advanced telepresence to emergent tech, as you explore the frontiers of UX design, AR/VR, and 3D you’ll advance your skills to harness the potential of evolving media. 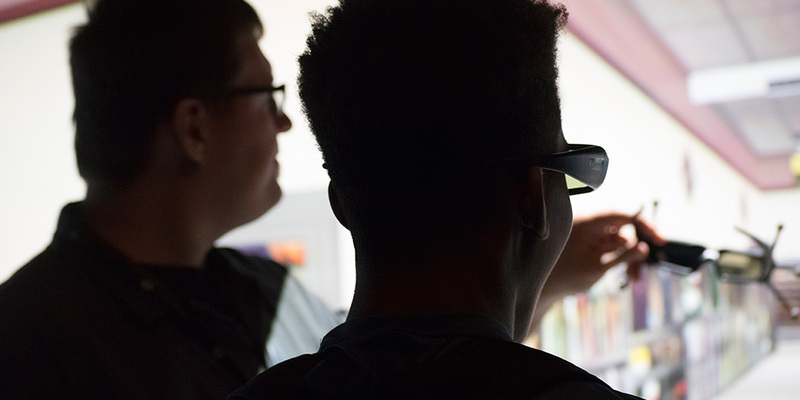 Students work with highly respected faculty to research how interactive technology intersects with issues such as social justice, community memory, and accessibility. Immerse yourself in interactive education, games and simulations for good, and 3D technologies. Develop research projects based in your specialty to advance trends in design, and enhance your career by documenting your accomplishments. Our students excel in producing dynamic websites, smartphone apps, digital illustrations and animations, audio and video. They learn how to research issues and solve problems in agriculture, education, manufacturing, sports, health, and medicine. You’ll learn and apply an understanding of the strategic design decisions, industry practices, and content production processes of complex, media-rich applications and interactive environments. Demonstrate mastery of the knowledge and the ability to apply associated technologies to novel and emerging problems. Present research to local, regional, national, and international audiences through publications in professional journals and conference papers given in a range of venues, from graduate seminars to professional meetings. Broaden your professional foundations through activities such as teaching, internships, fellowships, and grant applications. The School of Informatics and Computing at IUPUI provides myriad opportunities to utilize the skills you develop in real-world applications through research and collaborative projects. Access state-of-the-art facilities, including: the Media Arts Research and Learning Arcade, the Advanced Visualization Lab and a virtual reality theater. Collaborate with SOIC instructors pursuing groundbreaking research in 3D printing, AR/VR, serious game creation, and interactive media. Further your education with a program that fits into your busy schedule. Our evening classes easily accommodate working professionals. Part-time students can take advantage of our flexible timetable for degree completion. Full-time students may complete the program in two years. Media Arts and Science graduates work for prominent companies such as Pixar, Cantina Creative, Blizzard Entertainment, ExactTarget, Pacers Sports & Media, Wiley and Sons (Publishers of the For Dummies books), Tour Design (Livenation), Emmis Publications, USA Gymnastics, Capital Records, BET – Black Entertainment Television and Girls, Inc. Positions at these companies range from UX designers and 3D modelers to project managers and design leads.